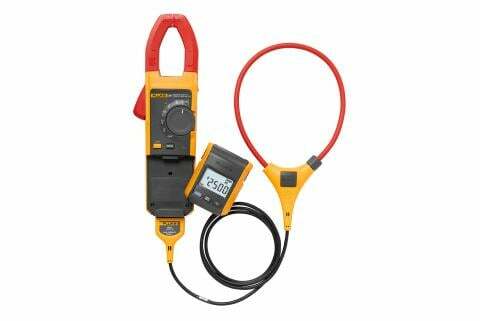 Measuring ac current with a clamp meter’s jaws. Note: Current flowing in opposite directions cancels each other. 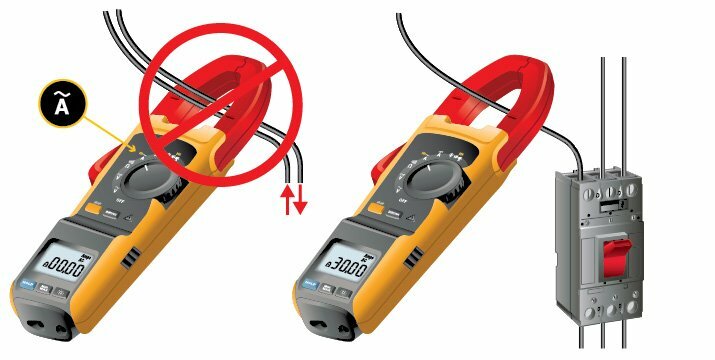 If current is moving in opposite directions, place just one conductor within the clamp during measurement. Disconnect test probes from the meter. Keep fingers behind tactile barrier on face of meter. Turn the dial to the proper function, either A ac or A dc. You should see the jaws icon ( ) in the display, indicating that the measurement is coming from the jaw. Note: When the measured current is < 0.5 A, the center dot in the display icon ( ) will flash on and off. When current is > 0.5 A, the center dot will be steady. 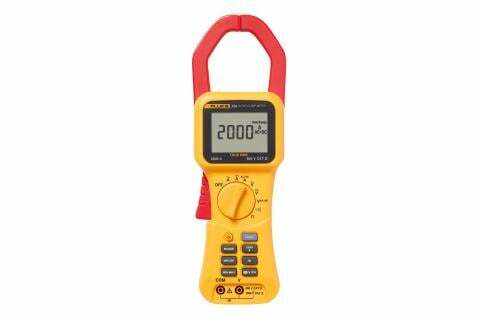 Before taking dc current measurements (if your meter is equipped to do so): Wait for the display to stabilize, then push the Zero button to ensure correct readings. Zeroing the meter removes dc offset from the reading. The Zero function works only when the dial is set in in the dc current measurement position. Note: Before zeroing the meter, make sure the jaws are closed and no conductor is inside the jaw. Press the jaw release level, open the jaws and insert the conductor to be measured inside the jaw. Close the jaw; center the conductor using alignment marks on the jaw. Do not apply the flexible probe around, or remove it from, hazardous live conductors. Take special care during fitting and removal of the flexible probe. De-energize the installation under test or wear suitable protective clothing. Connect the flexible current probe to the meter. See illustration above. Connect the probe's flexible tubing around the conductor. If you are opening the end of the flexible probe to make the connection, be sure to close and latch it. You should be able to hear and feel the probe lock into place. Note: When measuring current, center the conductor in the flexible current Probe. 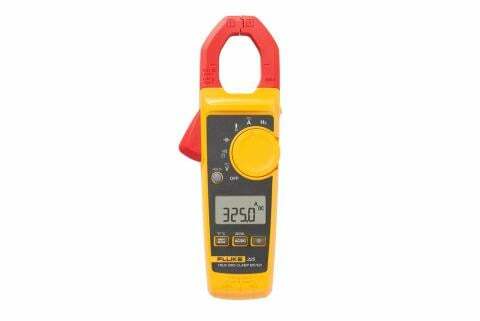 If possible, avoid taking measurements close to other current-carrying conductors. Keep the probe coupling more than 1 inch (2.5cm) away from the conductor. Turn the dial to the icon. When the dial is in the correct position, shows on the display, meaning that the readings are coming from the flexible probe. Note: When the measured current is < 0.5 A, the center dot in the display icon ( ) will flash on and off. With current > 0.5 A, the center dot will be steady. View the current value in the display. Inspect the coupling system to make sure that it is connected and closed correctly or for any damage. If any foreign material is present, the coupling system will not close properly. 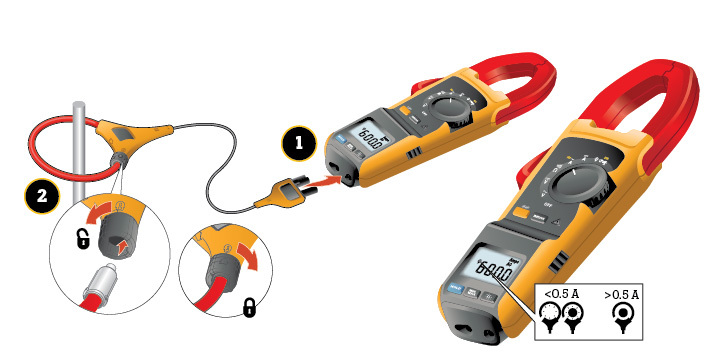 Inspect the cable between the probe and meter for any damage. Verify the dial is in the correct position ( ).